Al Meyers started the design of the 2-place Meyers 145 in the early 1950's. It would have retractable main gear and a steerable tailwheel. According to the late Nydia Meyers, Al's wife, in the course of running tests for it's Type Certificate, Al put the first prototype through an extensive series of spin tests. At one point, the aircraft went into a flat spin. Eye witnesses have told Paul Whetstone that they saw Al out on the wing, trying to rock the aircraft back and forth to get it out of the flat spin before finally jumping and popping his parachute. He had only a WWII surplus chute which was not very steerable and landed hard in a ploughed, dry field near the Meyers factory in Tecumseh, Michigan. He shattered his right ankle and the local medics put it back together and said he might never walk again. He proved them wrong. He built a new prototype in six months which eliminated the design flaw so that it passed all subsequent tests and earned it's Type Certificate. Only around 22 of the Meyers 145 aircraft were produced. Even then, aviation had started to rapidly change toward the private executive and family size aircraft. He then used his experience with the 145 to build the first Meyers 200 and delivered one 200 in 1953. While the exact Al Meyers production of 200 series is unknown, an October 1999 search of the FAA records reveals that there are registered: 8 200A's built in 1959-1960, 13 200B's built in 1961-1963, 7 200C's built in 1963 and 4 200D's built in 1964-1965. He then sold the company to AeroCommander for production in Albany Georgia. The Type Certificate for the MAC-145 was sold to Rockwell, along with the TC to the 200 series. AeroCommander produced 83 aircraft in 1966-1967. When Interceptor Corporation purchased the TC from Rockwell in 1968, they also received the TC for the MAC-145. Interceptor had no intention of producing piston powered aircraft so nothing was added to either the 145 or 200 but the TC was amended to include the Model 400 in 1971. When Peter Luce acquired the assets of Interceptor Corp. and formed Prop-Jets, Inc., of Colorado, both the TC for the MAC-145 and the 200-400 series aircraft were included. Paul Whetstone established Prop-Jets, Inc., of Texas, in 1983 and all the assets were transferred into the new corporation. Sometime in 1984-1985, Prop-Jets, Texas, was approached by Mrs. Meyers to see if they would donate the TC for the MAC-145 to the Al Meyers Foundation for historical purposes. Prop-Jets researched and determined that the TC had no commercial value and so it was donated, around 1985, to the foundation. About four years later, Prop-Jets discovered that the TC had been traded out of the foundation to enable Mrs. Meyers to have her 200D rebuilt after a gear-up landing. This was not our intention in transferring the TC so we set out to investigate. By then, Mrs. Meyers had passed away and the Al Meyers Foundation existed to provide about ten $1,000 per year scholarships to needy engineering students. Thus, Prop-Jets decided to ignore the unlawful transfer as litigation with such a worthwhile foundation would only serve to destroy its ability to issue scholarships, something we knew was of great value. The TC for the MAC-145 was largely ignored and dismissed. Around 1992, Paul Whetstone was approached by Mr. Milt Kimble who had some grandiose plans to produce the 200D. Mr. Kimble put several questionable propositions on the table, including several from foreign countries. All this time, unknown to Prop-Jets, Kimble was actively attempting to negotiate the sale of the TC to the MAC-145, which he finally sold to the Seminole Indian Tribe. The Seminoles set up a corporation, Estumkeda, Ltd., to purchase the TC and attempt to put it into production. (To see a copy of Estumkeda, Ltd.'s Type Certificate Data Sheet for the 145 in Adobe .pdf format, Click Here.) They hired engineers in Wichita, Kansas, and set out to bring the MAC-145 back into existence. Kimble and the project ran into difficulties in Wichita and he was replaced by the company pilot, F. DeWitt Beckett, around 1995. Beckett approached Prop-Jets and several licensing and royalty agreements were negotiated but never executed in 1995 and 1996. In January 1995, trying to help the 145 project get off the ground, Prop-Jets agreed to sell the drawings for the 200D vertical and horizontal and I400 wing to the Seminole's who by then were operating as "The New Meyers Aircraft Company." (Beckett immediately proceeded to change those FAA approved drawings, thereby negating their certification.) Paul Whetstone actually went to Wichita in the summer of 1995, around the Fourth of July, to attempt to help get a first flight accomplished, which did not take place. By separate letter agreement, Prop-Jets had agreed to let Estumkeda, Ltd. (the Seminole Indian's company) use the name Meyers™ "as long as satisfactory licensing agreements are (were) negotiated." Both parties tried to negotiate but the board of Estumkeda was not satisfied with the progress of the 145 and was unwilling to commit any funds for the 200 until the 145 was finished. At this point, Whetstone and Beckett came to several impasses regarding changes to the 200D. Beckett wanted to change the engine from the Continental to a Lycoming. The Continental is a bed mount type engine and the Lycoming has a rear, dyna-focal mount system. Just this change would have necessitated an incredible new certification effort as the nose gear attach mechanisms, the entire nose wheel steering and the loads at the firewall attachpoints would all change. Also engine systems, fuel selector valves, fuel lines and fuel pumps would require re-certification. Beckett also wanted to offer the 200D standard with Trimble avionics. No aircraft in the class of the 200D had Trimble avionics. At that time, Bendix/King would had to have been the standard (Garmin and others may have changed that perception slightly as of this writing in late 1999). Whetstone was unwilling to let unnecessary changes to a proven and great design be made by Beckett and get the 200D project into the same regulatory mess that the 145 (now SP20) was under. Whetstone was not willing to let the 200 project be thrown into an unnecessary multi-year certification program with still seemingly incompetent engineering personnel responsible for the design and engineering. In late 1996 or January 1997, Beckett then came out with an advertisement for the "Meyers 300" stating that they were going to make the four place aircraft from the 145, like Al Meyers had done with the 200, but do it better. Note that they still had not certified their aircraft due to the many, and in Management's opinion, haphazard changes made to a great design. At that time, Prop-Jets revoked their right to use the name Meyers™. Beckett continued to use the Meyers™ name (probably with Al rolling over in his grave) in defiance of Prop-Jets request for cessation. 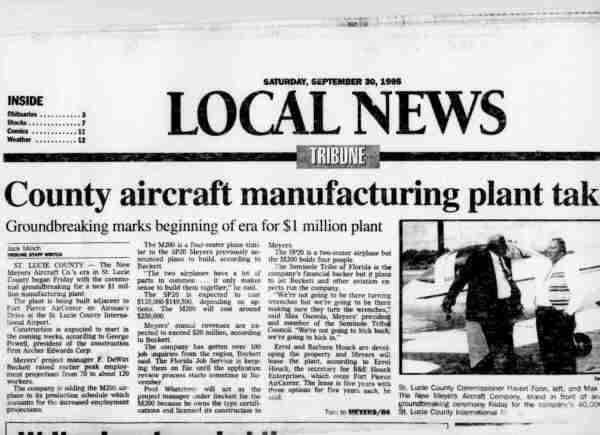 In February, 1997, Prop-Jets filed a trade-mark infringement suit in Federal District Court in San Antonio, Texas, and reached a settlement agreement with Estumkeda in eight days after filing. 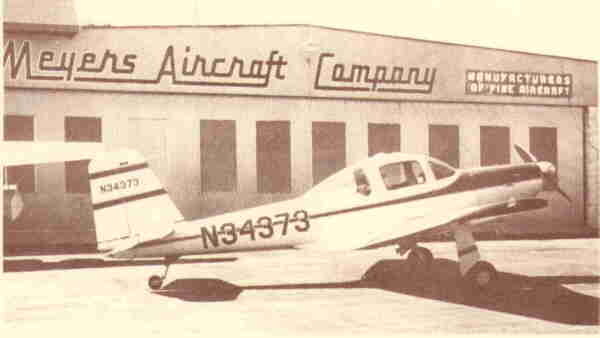 Thus was born Micco Aircraft Company and the SP20. AvWeb has just reported that the FAA granted an amended Type Certificate to Micco Aviation for the MAC145-A on Wednesday, January 5, 2000. This is over fours later than originally anticipated. Mr. Beckett is now promising to deliver 50 units this year according to the press release. We wish them well.